Use your food processor to blend up this healthy snack in seconds. Trim and chop produce into similar-sized pieces. Place in food processor and pulse just until a chunky salsa forms, do not over blend. If desired, sweeten with honey and season with salt. For tortilla crisps: Cut tortillas into 10 wedges each. Place on a baking sheet, coat with nonstick cooking spray and sprinkle with a sweet or savory seasoning combination. Bake for 12-15 minutes. TIP: Short on time? 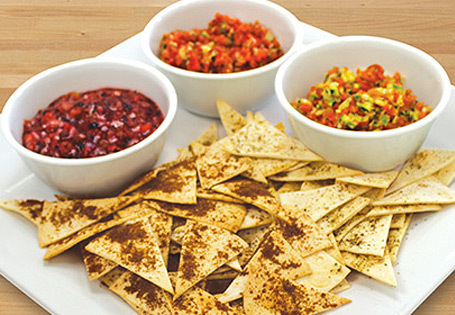 Serve salsa with whole grain crackers, graham crackers or tortilla chips instead of making your own.